Kentucky is the home of legends, whether they be pioneers, sports heros, or Kentucky Legend Hams. 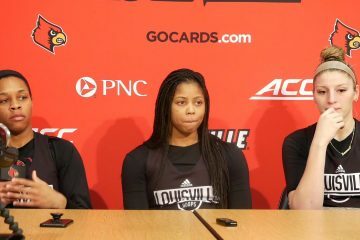 In that vein, Louisville hosted women’s basketball legend Tina Thompson and her 7-10 (1-3) Virginia Cavaliers Thursday night at the KFC Yum! Center. But Jeff Walz has a bobble head, and that’s guaranteed legendary mojo. The Cavaliers have shown signs of life, most recently with a 19-point comeback against in-state rivals Virginia Tech. But that was followed by a 38-66 shellacking at the hands of NC State. Despite the hall of fame tutelage from Thompson, more thwacking was in store as the Cardinals would demolish the Cavaliers with a final score of 91-43. The first quarter would ultimately not be the template for the next three, as the Cards started the game with a slightly lackluster performance. While Virginia immediately set about their standard, “Turn The Ball Over,” approach, the Cardinals could not find the offensive spark to take advantage. Some of the focus points for Walz, such as box outs and cheap fouls, would stalk Louisville throughout the first quarter and allow the Cavaliers to stay within four points at 15-11. Pre-game concern dwelled on the impact that 6’9” Nigerian center Felicia Aiyeotan might have as she continued her rehab off the bench. 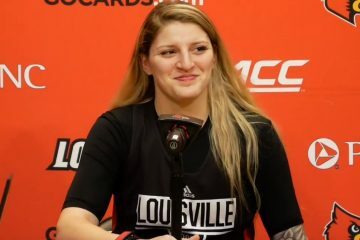 She would quickly make her presence known with two points at three rebounds to end the first quarter, but the Cardinals would not be intimidated. Kylee Shook would slam down a massive block to the thunderous applause of the Yum! Center patrons to start the second quarter, and it was off to the races. The Cardinals would quickly embark on a 6:00 21-3 run at the expense of the Cavaliers wherein Virginia experienced a 4:30 scoring drought. This would be followed by a 24-3 run in the third on a night featuring 11 Cardinals in the scoring column, led by Asia Durr’s 20. Louisville finished a season-best 57% from the field while going 12-24 from beyond the arc and the Cards would never trail at any point in the game. Two-thirds of the Cardinal’s points would come from points off turnovers and second-chance points, with Virginia turning over the ball 20 times and Louisville taking it away 12 times with steals. 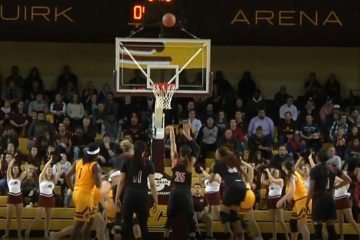 As the lead extended there were two scary moments, as first Durr and Shook would go down after a collision then Sam Fuehring would hit the deck after a rebound attempt. 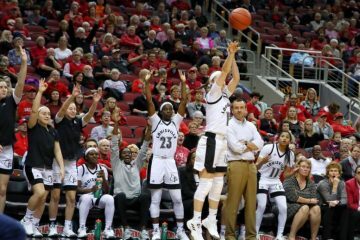 Fuehring walked back to the bench as her bloodied lip swelled, all the while attempting to convince the referees that egregious contact had been made. Whatever she said, it worked. The official went to the monitor and awarded Louisville two free throws off an unsportsmanlike foul from Virginia’s Moné Jones. Fortunately, despite Fuehring’s lip, the Cardinals would exit the game essentially unscathed. Ultimately, the Cards would dominate most facets of the game. Most satisfyingly, this would include several of Walz’s repeated points of emphasis. Louisville limited first half fouls to six, and the Cavaliers would only go to the charity line four times throughout the night. The Cards would ultimately out-rebound Virginia 42-27 with Fuehring and Shook both notching eight grabs. Virginia’s leading scorer Toussaint would only have nine points, which matched well with her nine turnovers. Virginia’s Aiyeotan is still on limited minutes during rehab, but would manage to contribute four points and five rebounds. Special recognition goes to Cardinal sophomore Dana Evans. 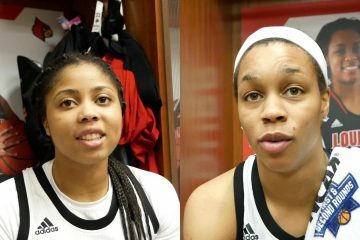 While all Louisville players would contribute to a night featuring 19 assists, it was Evans who took the reins while Durr spent time on the bench. Evans would finish the night with 14 points and a perfect 6-6 from the field with four assists. One would be remiss to not also mention the stellar play of Shook and Fuehring in the post, who combined to contribute 18 points and 16 rebounds. 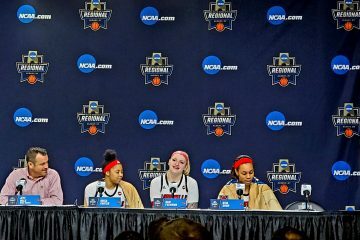 Tina Thompson certainly has her work cut out for her in Charlottesville, and only time will tell whether or not she can right the Cavalier ship. As for Walz and the Cardinals, it’s back to the road for a match-up against Wake Forest this Sunday, January 20th in Winston-Salem followed by a showdown with the Seminoles in Tallahassee on Thursday the 24th. 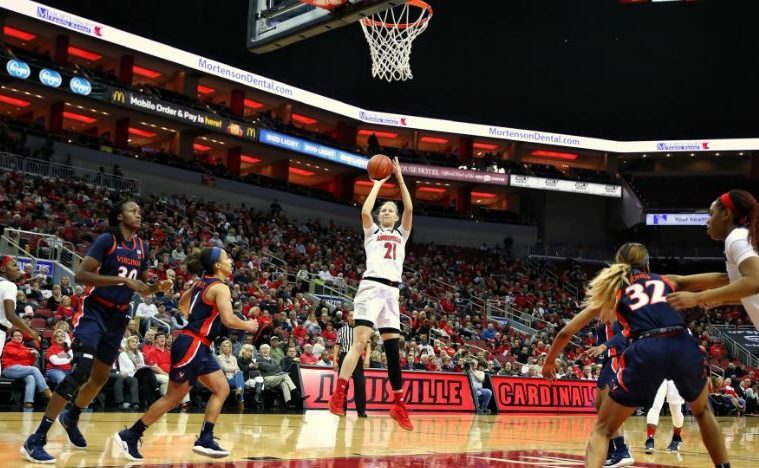 Women’s basketball action will return to the KFC Yum! Center on Sunday, January 27th featuring the struggling Pitt Panthers. Will the Cardinals continue their winning ways? If you ask the Jeff Walz bobble head, he says yes.